The fact should be acknowledged that if the Garden of Eden was so perfect, how did a talking snake get in and who created it (God Himself!)? Plus, it appears this talking snake had “Free Will” and could speak fluent Classical Hebrew. Moreover - contra to Christian theology - the word “Satan” never occurs in Genesis leaving us with just a story of a talking snake supplying Eve with very truthful and accurate information about the Tree of Good and Evil. Fact is, God is not only exposed in His very own book (the Bible) as a liar, but from the facts presented in Genesis we also MUST conclude that either God has very limited abilities (just like the humans he created) or God is just one constant liar! The example for this is Genesis 3: 8-9. Here either God really does NOT know where Adam and Eve are (“They heard the sound of the LORD God walking in the garden in the cool of the day, and the man and his wife hid themselves from the presence of the LORD God among the trees of the garden. Then the LORD God called to the man, and said to him, “Where are you?’” Genesis 3: 8 – 9) or God really did know where Adam and Eve were hiding and just plainly lied again! (Apologetically, the claim is made that, “Well God really knew where they were, but He just wanted them to acknowledge what they had done (ate of the tree). However, this apologetic ploy makes the situation even more confusing as they already knew what they did . . . that’s very reason they hid in the first place! So if this apologetic answer is accepted, then God is at best making very insincere muddled statements or just lying yet again. Once Adam and Eve are located, the story has Eve lie so God won’t look like “the father of all lies” that He is: “Then the LORD God said to the woman, “What is this you have done?” And the woman said, “The serpent deceived me, and I ate.” (Genesis 3: 13). Fact is, there was no deception at all as exactly everything the snake said was true and accurate! Now it’s time for God to lie some more in his only address to the talking snake: “The LORD God said to the serpent, “Because you have done this, Cursed are you more than all cattle, And more than every beast of the field; On your belly you will go, And dust you will eat All the days of your life; (Genesis 3: 14). Just how are cattle “cursed”? Just how are “every beast of the field” cursed? Hell, all the animals and humans involved in this story are still in the Garden of Eden when God makes this wild statement about cattle and beast being cursed as if they had sinned too! When we consider God’s curse on the snake; can anyone provide any scientific fact (apart from secular evolution) that snakes could walk, talk and that all snakes they now feed on dirt?? 1. God lied to Adam about dying the day as he ate of the “Tree of Good and Evil” (First recorded lie in Biblical history). 3. 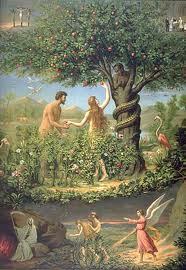 God knowingly allowed Eve to lie to protect his character so the blame could be shifted to the snake. By not correcting Eve’s claim, God is complicitous in Eve’s lie. 4. Since God hates the truth, He now punishes the snake. 5. Finally, God curses the snake by removing his legs, (though not explicitly stated; also its ability to speak) and then lies about making all future snakes feed on dust / dirt. *For Christians to claim that Adam and Eve (like the rest of humanity) died a “Spiritual Death” that day only begs the question even more as they were NEVER promised a spiritual life by God in the first place! This is pure conjecture on the part of Christianity trying to vindicate a lying God!